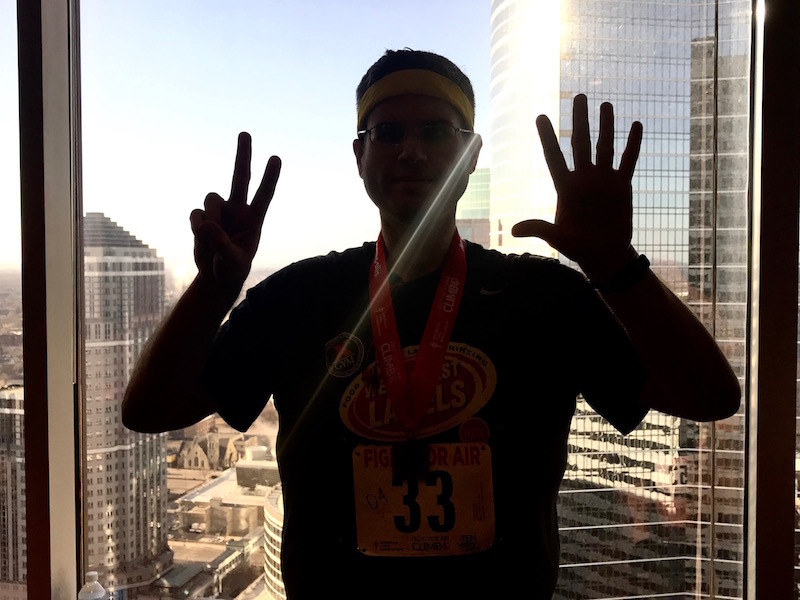 Sixty Minutes of Stairs (Minneapolis Fight For Air Climb Race Recap) | Keep It Up, David! 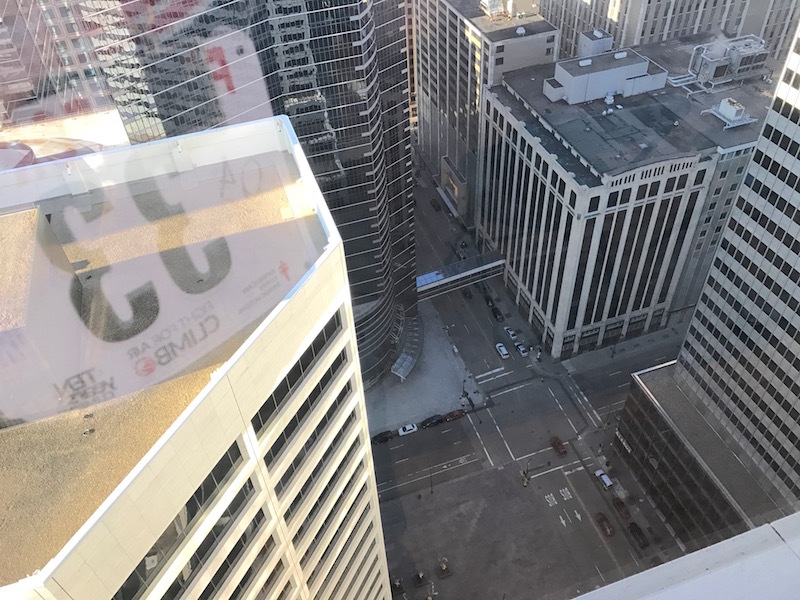 The race was the Minneapolis Fight For Air Climb, organized by and benefiting the American Lung Association. The venue was the North Tower of the U.S. Bank Plaza in downtown Minneapolis. The building and stairwell were brand new to me: not only had I never stepped foot in the U.S. Bank Plaza before, this was actually my first time ever visiting Minnesota. I was extremely nervous for this race, and the nerves kicked into overdrive when I collected my bib at 6:30am. I was competing in the Ultimate Climb. It’s an endurance event, where you see how many times you can climb the building in one hour (stairs up, elevator down). The rules for this race said that if you entered the stairwell before your 60 minutes were up, you could finish the climb, so there was the potential to race for a little longer than 60 minutes. The race started promptly at 7am, and they let one person enter the stairwell every ten seconds. I began climbing at 7:04. I synced my watch so I could see, whenever I wanted, how much time I had left. I really love taking the first step during a stair race, because the nerves instantly vanish, replaced by a surge of adrenaline and the desire to tackle the challenge headfirst. Even though I had never been in the building before, the stairwell seemed familiar. Maybe that’s because most stairwells are remarkably similar: ugly, monotonous assemblages of concrete, drywall, and steel, all in a glorious array of grays and off-whites. This stairwell had left turns, a couple fire doors (all propped open), a 30-foot jog on the 22nd floor, and a few water stations manned by volunteers, who cheered us on with foam fingers and cowbells. My first climb was all about getting a feel for the stairwell, and pushing myself moderately hard, since I knew this climb would be my fastest, and I wanted to see what I could do, but without wiping myself out completely and sabotaging the rest of the hour. The first climb felt successful, by that criteria, and the second climb felt strong too, although I forced myself to slow down and settle in for the long haul. I glanced at my watch in the elevator after the second climb and fifteen minutes had elapsed. Holy crap! If I kept this pace up, I could do eight climbs! I quickly squashed that thought, though, because I knew maintaining that pace would be near impossible, just due to the exponentially draining nature of stair racing. But six climbs would be totally doable, and seven climbs a distinct possibility. Since I had arrived in Minnesota with the vague notion that I could probably pull off five climbs, the idea that I was on track towards six or seven really helped keep my spirits up as the fatigue and burn started accumulating in my quads and calves, then lungs, and, slowly, everywhere in between. My third, fourth and fifth climbs were grinds. I was continually pushing myself, trying to not let exhaustion prevent me from double-stepping, using handrails, and pivoting on the landings, although there were many times those things didn’t happen. “Yes,” I blurted out between heavy breaths. We ended up in the same elevator after that climb, and he explained that he had read this very website when he started competing in stair races. To come 1,500 miles to a new state and be recognized is a feeling that, in the moment, I couldn’t wrap my head around (thank you, oxygen deprivation to my brain), but it pushed me to keep working those stairs hard. I entered the stairwell for my sixth climb with only about 12 minutes left. By this point I was determined to complete seven climbs, and I realized I was cutting it close, especially when you factor in waiting for the elevator (which is completely unpredictable), and the elevator ride itself. Man, was I tired. I had reached the point where any forward, upward motion was a reason to celebrate, but now I had to do more. Much more. I had to beat the clock, after 45 minutes of near-continuous stair climbing. My legs were blazing. My lungs were burning. My eyes were stinging from sweat, which had also soaked every inch of my clothing. The only thing I could do was ignore the clock and climb. Focus on the double-stepping, my music, the cowbell, anything but the clock. 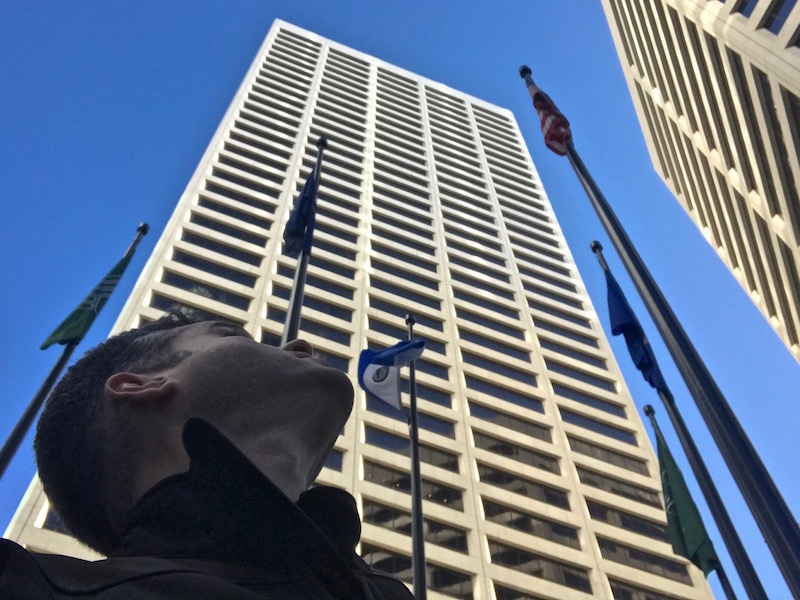 That sixth climb felt twice as tall as all the others, but eventually I spilled out into the 31st floor, and glanced at my watch as I jogged to the elevators. Four minutes left. I turned the corner into the elevator lobby just as some elevator doors were closing. I called out “hold the elevator!” and they did, and the excitement of knowing, for sure, that I’d get a seventh climb in made my heart race even more than it already was. I bounded into the stairwell with three minutes left, with a giant sense of relief. Since I had made it into the stairwell, this climb would count. This was it. One final climb. Once I got to the top, I’d be done. After the stress of the last climb, this climb felt carefree and celebratory, like a victory lap, except every muscle ached and it felt like all limbs were about to pop off my torso and shatter into a million pieces. …but eventually I was able to relax, even if I didn’t have the energy to muster a smile. 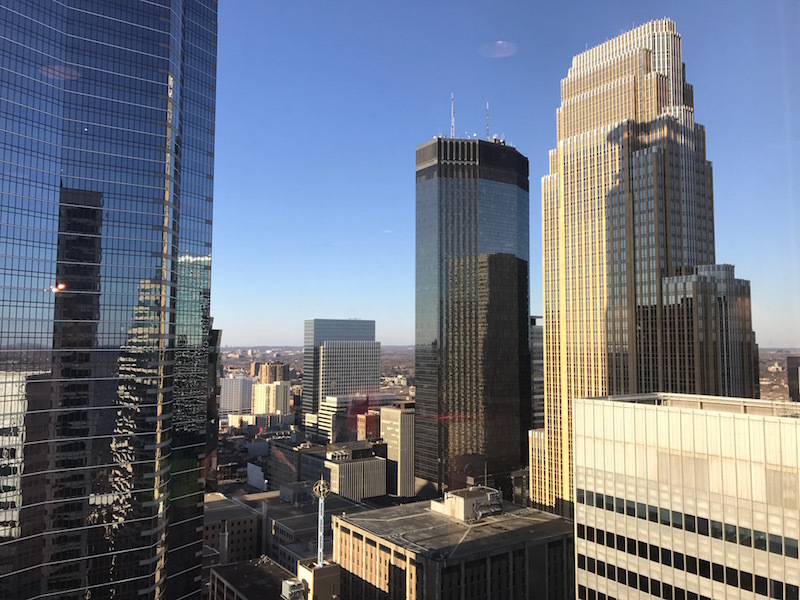 We got to hang out in a room with a great view of Minneapolis. It’s a long way down to the street! I knew a couple people at the race. That’s Nam, me, Jason, and a new friend, Kate. 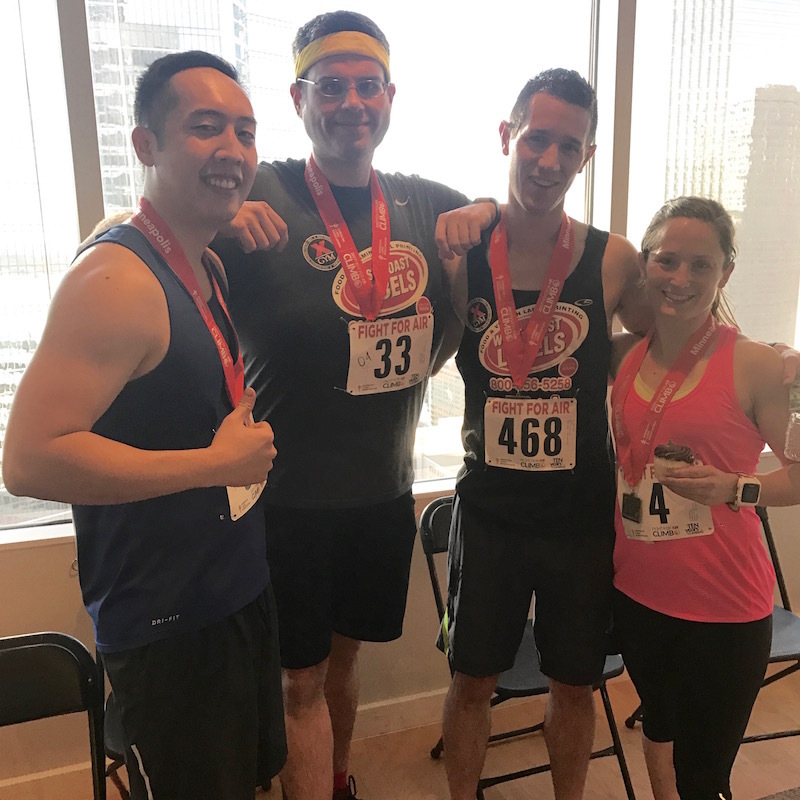 Kate completed nine climbs, and Jason won, for the fourth time, the single-climb event, scaling 31 stories in a mind-boggling 3 minutes, 40 seconds. (And that’s roughly 30 seconds slower than his personal best!) I’ve known Jason for about three years; he’s a great guy and one of my role models, and you’re see more of him in an upcoming post. I spent a total of 58:11 climbing up that stairwell. 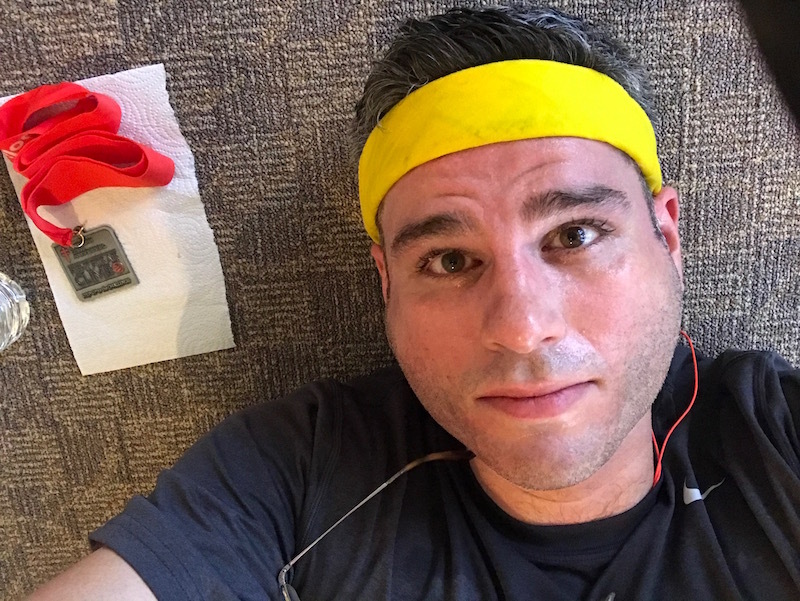 My total time was 1:06.35, which means I spent 8:24 in elevators, waiting for elevators, or in hallways getting to and from elevators. That means my average break between climbs was 1:24 – less than 90 seconds! 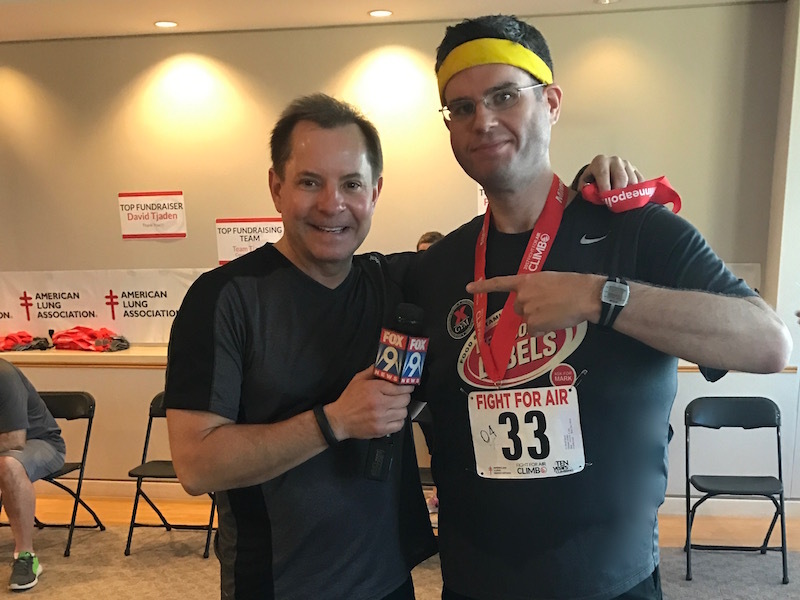 He’s a very nice guy, and he’s covered this race for years. Big shout-out to Jason on this one, too, for suggesting to Todd that he include me in his coverage. 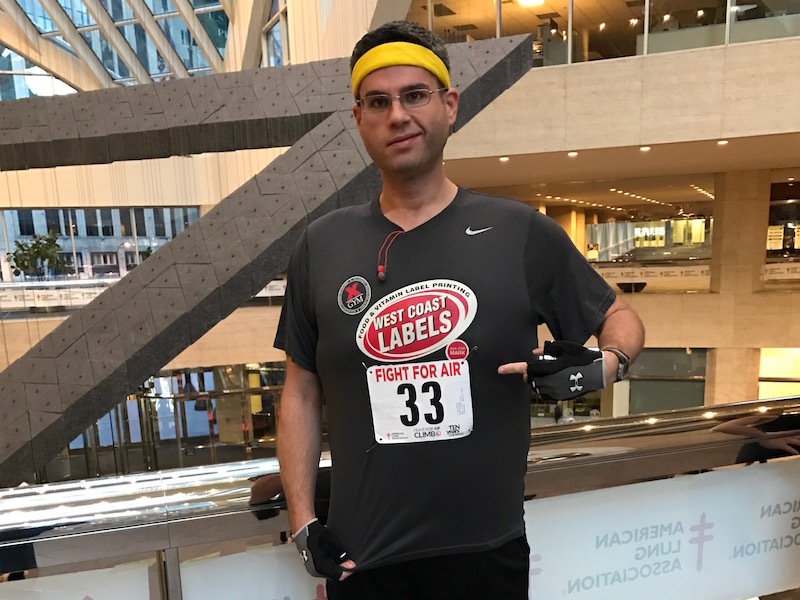 Another big shout-out goes to Bowflex, my sponsor for this race. I use their products all the time, and they’re extremely supportive of me, my blog, and my racing. While it’s so cool to have a fitness leader and household name helping me cover travel and race expenses, what I really value are the friendships I have with so many members of the Bowflex team. Another big thank you goes to MJ, who made a very generous donation to the American Lung Association on my behalf. 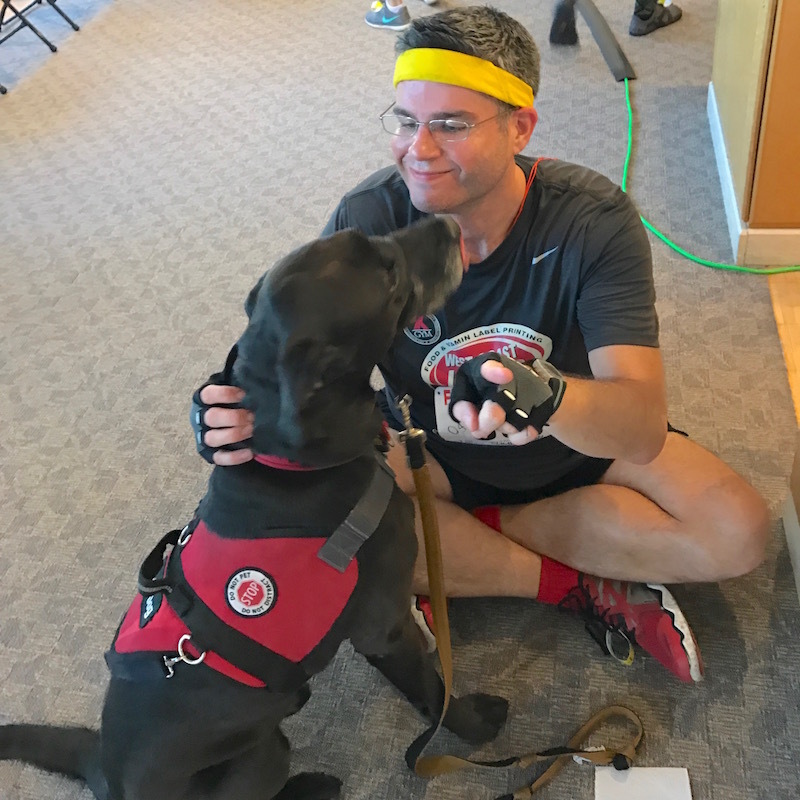 She’s a reader of this blog that stepped up to support me in my very first race in her hometown. The biggest shout-out, though, is the one I’m giving myself. I’ve been reminiscing a lot lately about how far I’ve come, especially with the “Missing Richard Simmons” podcast stirring up so many memories. 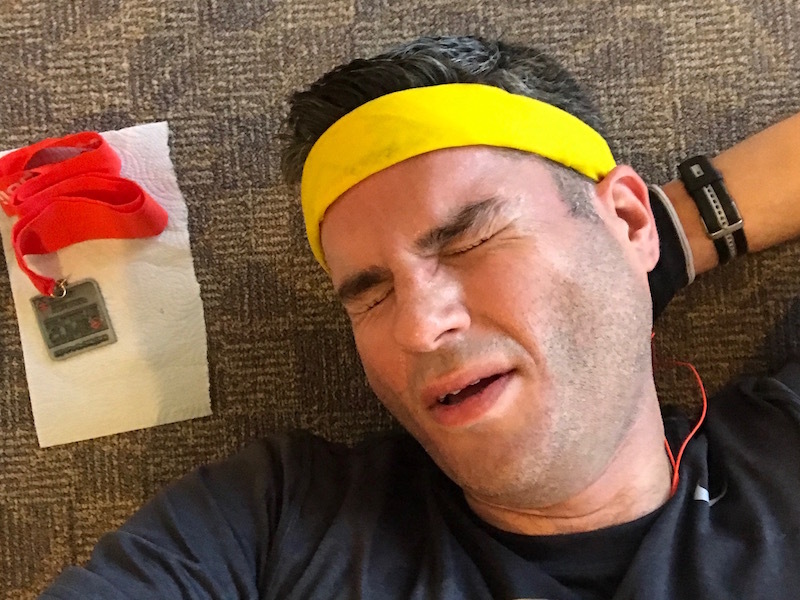 I firmly believe that stair racing has been a vital component to my weight loss success, and every time I exit a stairwell – especially after a grueling power hour – I’m blown away by my own strength, will power, and bravery. That feeling makes me soar higher than the buildings I climb. Even after 41 stair races, I still treat each race as an opportunity to prove to myself that I’m capable of astounding, life-affirming things, and I don’t disappoint. 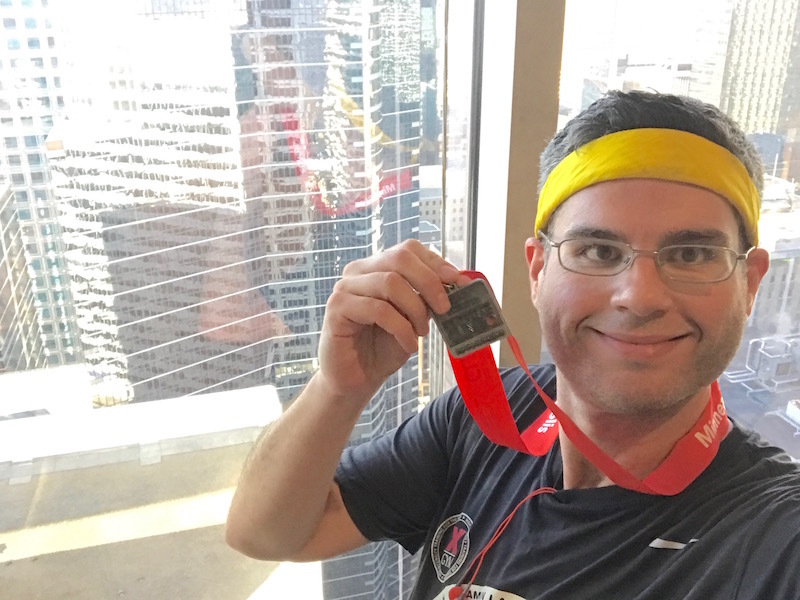 And get ready for this: My 42nd stair race was the very next day, in an iconic Chicago skyscraper. And you’ll read all about it in my next post! This entry was posted on Monday, February 27th, 2017 at 1:46 am and is filed under Uncategorized. You can follow any responses to this entry through the RSS 2.0 feed. You can leave a response, or trackback from your own site. You are amazing! I find inspiration in every one of your posts! It was my honor to sponsor you and thank you for the sweet email! No, THANK YOU! And keep it up! Really enjoyed reading this David! Thanks – can’t wait to see you soon!